I know I’m going a little overboard with Mexican food this month so I’m going to use Cinco De Mayo as an excuse. 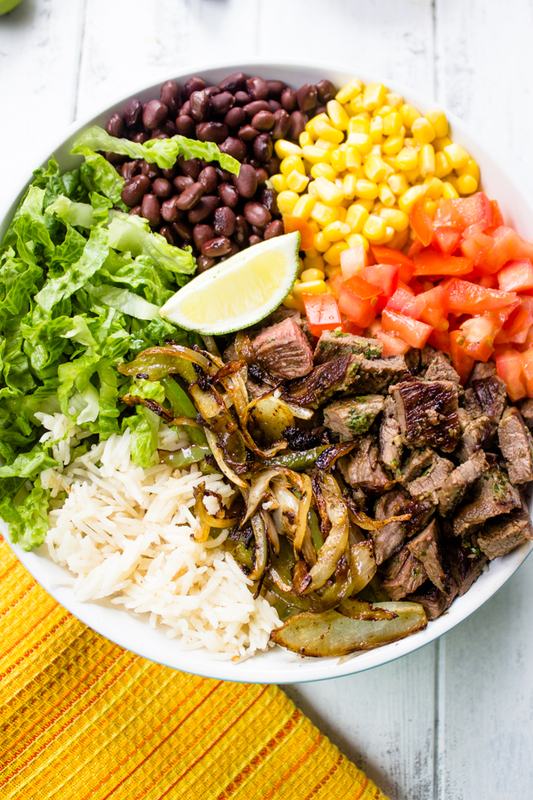 Last time I shared my chicken burrito bowls they were a huge hit so I decided to share my all-time favorite steak burrito bowl recipe. 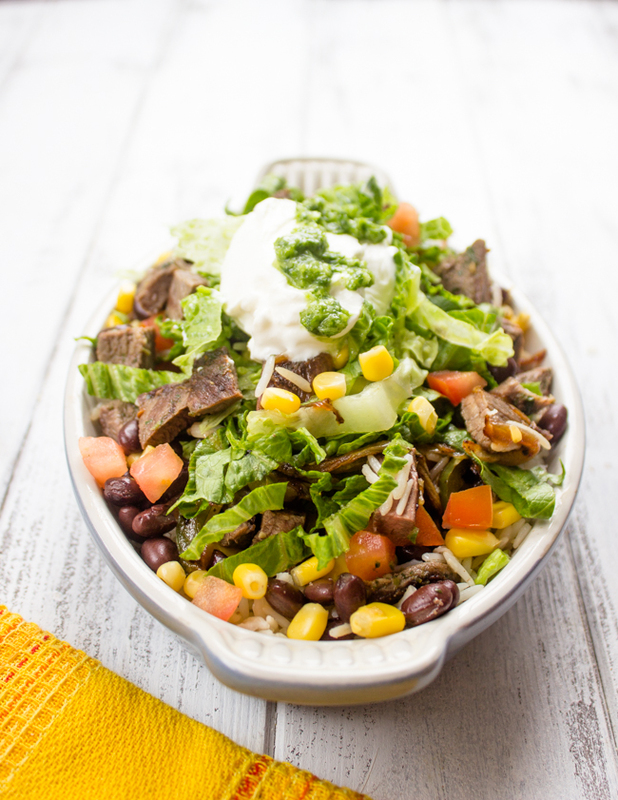 It’s similar to the chicken burrito bowl except the chicken and steak are marinated in different spices. For the chicken bowls I used a chipotle marinade which is red and spicy and for the Steak, I used my quick and easy cilantro lime marinade. 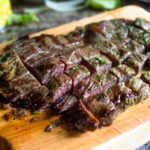 You can use either marinade for the chicken or steak but I find the cilantro marinade so much better on steak because of the cilantro lime combo. 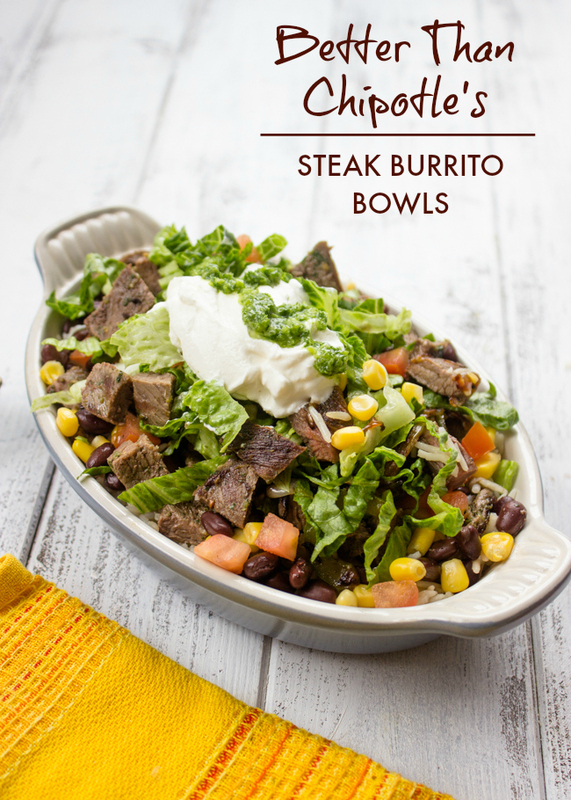 What I love about burritos bowls is that they are really easy to put together and are also very budget friendly. You can feed the entire family with just 3-4 steaks because you also have the wonderful mixture of beans, rice and veggies. Another great thing about these bowls is that you can chop the veggies and marinate the steak ahead of time, then throw the steak on the grill as needed. Also, these bowls can be eaten hot or cold so that’s a plus for me! 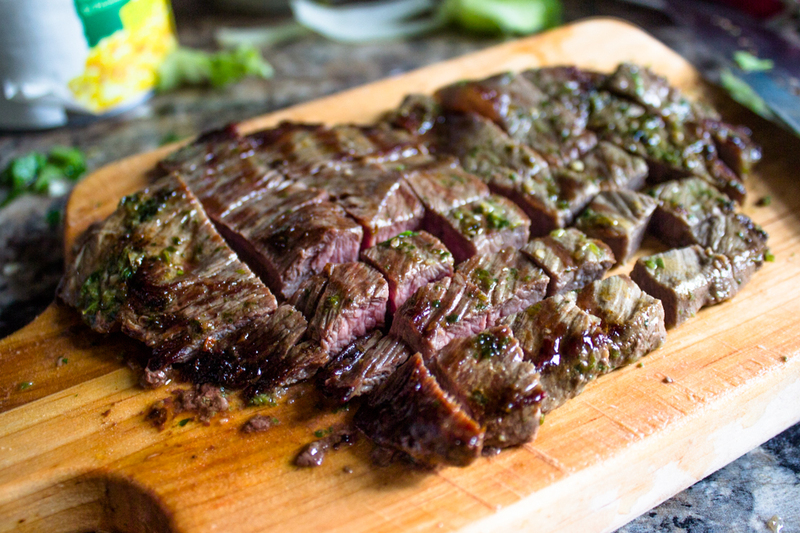 The steak should be marinated for 2-3 hours but you can also be marinated it on the spot and it still tastes amazing. After cooking the steak allow it to rest for at least 5 minutes because cutting. After the steak has rested cut it into small bite-size squares. I’m would be lying if I told you I didn’t munch on a few pieces of steak while I was cutting it. But hey, who’s counting..
For the cilantro lime marinade chop the cilantro, jalapenos, and garlic and bled them in the food processor with olive oil and lime juice. You can get the full recipe here with step by step pictures. 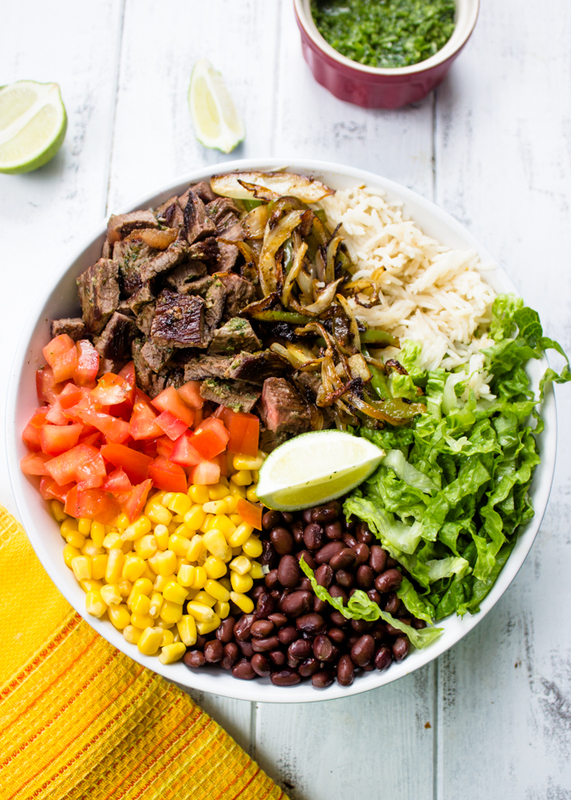 While the steak is cooking chop the veggies and arrange along with the cilantro lime rice in a big bowl or platter. After the steak is cooked and cut layer the burrito bowls in small individual bowls. 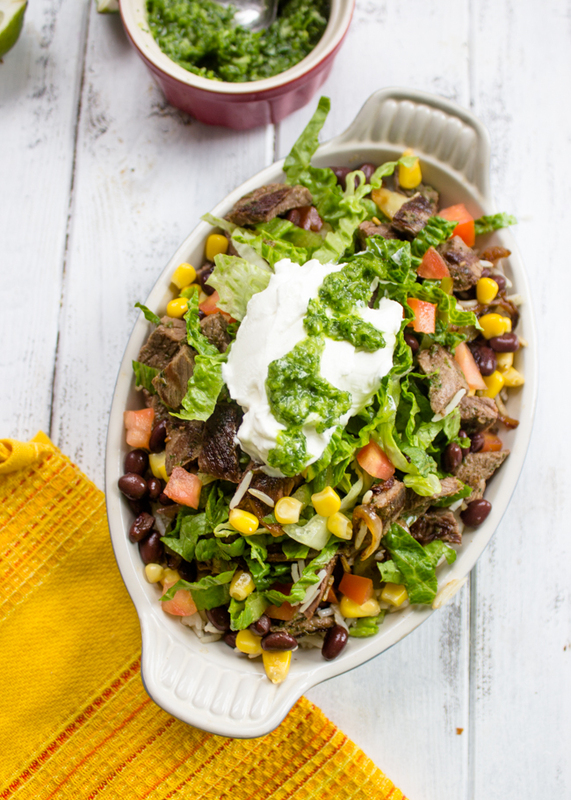 Place a layer of rice, a layer of beans, tomatoes, and corn, a layer of steak and onions, a layer of salad, and then top with a sprinkle of cheese and a teaspoon of sour cream. Am I able to cook steak on stove top or broil? Any suggestions. I made this last night and it turned out delicious! I ended up using a 2lb “London Broil” steak, marinating it for about 4 hours and grilling it. I left out the onions and bell peppers and made fresh pico de gallo instead. My husband and I like to meal prep, so we essentially doubled this recipe and ended up with 8 servings total (4 nights worth of dinners!). Waaaay too many typos in this post. Rediculous. I don’t want to sound stupid but is there any special way to cook the beans or just over the stove? You can cook them over the stove or just use them straight out of the can! Awesome, It look so yummy. wanna try it. Thank for sharing!!! This looks SO yummy. What are the nutrition values, please? Thanks! 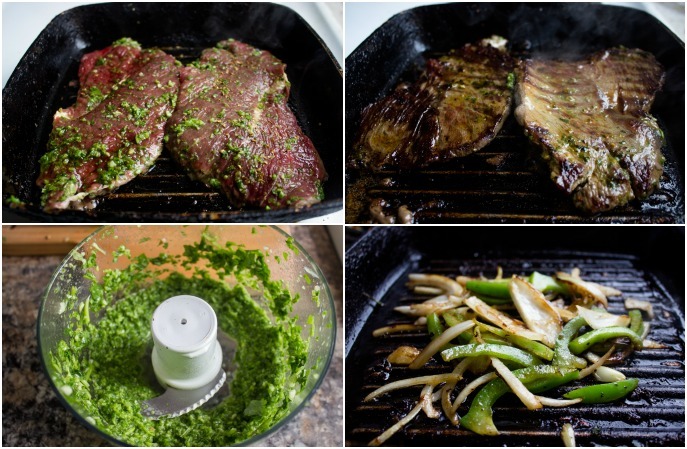 Have you tried using a small chuck roast and grilling it for this? My husband invited people for dinner last minute and steak burritos sounded good but that is the only cut I have. Made this tonight it was delicious ! Made this tonight. It was delicious! Made this last night and it was a hit!! Took care of my Chipotle cravings (I’m pregnant and nervous to eat there with all the food poisoning issues they’ve had). Made it exactly how the recipe calls with my homemade salsa. Love the marinade for the steaks. Thanks for such an amazing recipe!!! What cut of steak do you use? would a George F. Grill be ok to use for this? Yes, it works great on an electric grill!! I made this for dinner tonight, it was simply amazing. I made the recipe to the letter however, I omitted the grilled onions because I had already made fresh pico de gallo. I eat gluten-free, it’s nice to find another simple and fabulous dinner that you can make fresh (w/o processed food). I’m so glad you enjoyed it! Homemade is always fresher and healthier than anything else. Would love to hear reviews from anybody on this site that actually cooks. I love Chipotle but always end up feeling like I could make something better/cheaper at home! These bowls are proof that it is possible! I need recipe ideas using lettuce so this is a great one! Can’t wait to enjoy these burrito bowls! Delicious! Both the pictures, yet the recipe! I’m going to put it on my to-do list. Utterly gorgeous! I could dive in right now. More mexican recipes is always a good thing!! haha at least I certainly think so : ) This looks delicious!! Oh my word, this looks AMAZING! I absolutely adore Chipotle’s burrito bowls, but this definitely looks like it would give Chipotle a run for their money! Pinned!